Yes, I have completed three more of the notebook covers. One of these was only a pieced cover yesterday, but today it is finished. The horse embroidery is one that I digitized for my embroidery machine way back in 2014. I think it looks lovely on this notebook cover framed with sun-printed and hand dyed fabrics. The blue and green one on the left has hand woven fabric, sun-printed and hand dyed fabrics pieced into the cover. The purple and blue one also features some of my hand woven fabrics. There are some textured yarns in both of the hand woven pieces so it has some extra "feel appeal." It also has hand dyed barics and batiks. 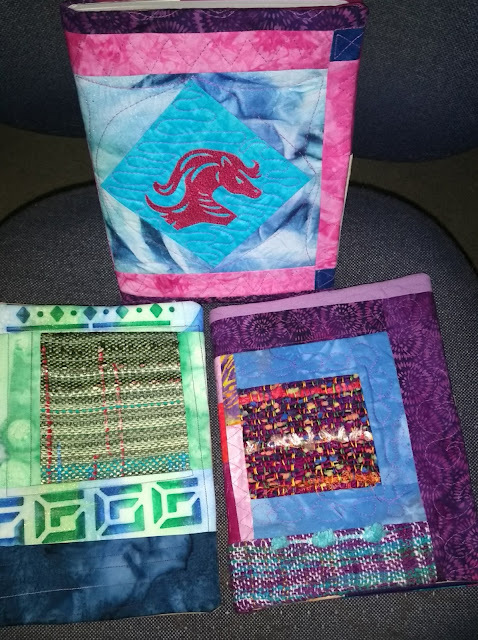 I am really enjoying piecing, quilting and assembling these notebook covers as I get to use so many of my creative energies in each of them. Plus, I love sewing my labels (from www.ikaprint.com ) into each of them - thus leaving my mark on them for posterity. I plan to also start adding one of these small labels on each of my quilts as I finish them. You have me wanting to get back to notebook covers. I hope you sell a lot. A very nice way to use little fabric gems!